Atlanta United today announced the signing of 21-year-old forward Hector “Tito” Villalba as a Young Designated Player, pending receipt of his P-1 Visa and ITC. 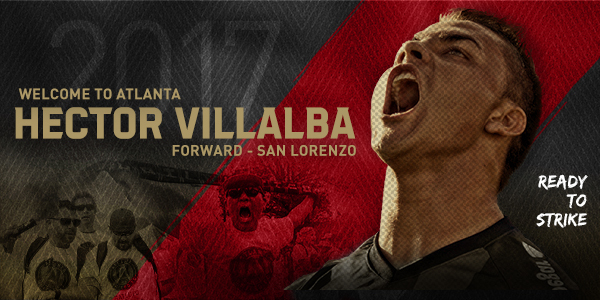 Villalba comes to Atlanta from Argentine Primera División club San Lorenzo. Villalba was selected to join Buenos Aires based San Lorenzo at age 10, and came up through the club’s youth system. He made his professional debut in August 2012 playing under technical director Ricardo Caruso. At only 21-years-old, Villalba has made over 100 first team appearances for San Lorenzo scoring 16 goals. In 2013, Villalba was part of the San Lorenzo squad that placed first in the Primera Division’s Torneo Inicial, the first tournament of the season. San Lorenzo finished first in the tournament gaining entry into the 2014 Copa Libertadores. The side advanced out of the group stage with a 2-2-2 record, but were seeded 15th heading into the Round of 16. San Lorenzo then rallied for four straight wins to lift the trophy as club champions of CONMEBOL. Villalba started all 8 knock-out stage matches including both final legs of the competition. He rounded out 2015 as part of the San Lorenzo squad that won the Supercopa Argentina with a 4–0 victory over Boca Juniors. Villalba will be on loan for the remainder of the year and will arrive in Atlanta in January. See why he’s nicknamed “the goal machine” from YouTube user Fortaleza Prod. Previous Previous post: Tree Sound Studios and Mali Hunter Celebrate Violinist Lee England Jr.